Here in northeastern Illinois, we don’t get much sunlight at this time of the year, but last week brought sunlight in a ‘on one day, gone the next’ fashion. Thursday morning after dropping W off at school, I caught the sun rising over the same field and stopped to take the shot. Here it is….. It was a great way to begin the day. Because of the snow, my drive to work was slow and worried, but when I arrived at school, all was well. The kids were eager to learn and it was a great day. The day counted in so many ways. I am thankful. When I got home Friday evening, I was tired and I could have fallen asleep on the couch, and I almost did. Nevertheless, I stayed awake long enough to visit a neighbors for Sundaes on Friday with O and B and had a good time visiting. When I awoke this morning, my bedroom window revealed a new world, as it does every morning, and I was again, greeted by the sun. What a great way to begin the morning. I enjoyed my morning coffee reading with Ivy curled up beside me with her head in my lap on the couch and the sound of the Beatles’ ‘Here Comes the Sun’ from Abbey Road playing softly beside me. It reminded me of the importance of the sun. Today is gonna be a great day, I know it. It will be full – full of schoolwork, housework, distractions but that is what the sun brings, every day. 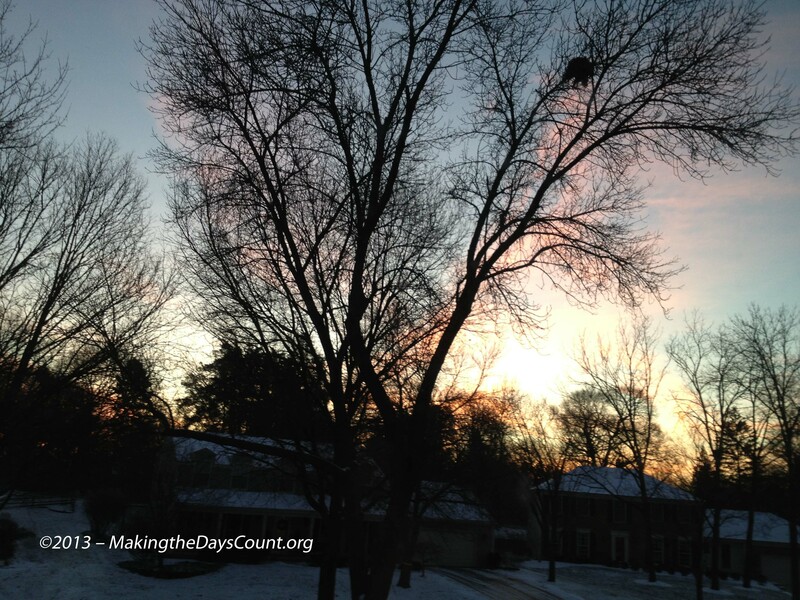 Making the Days Count, one sunrise, one morning, and one step at a time. What is gonna make today great for you? Classic song with some great pics to go along with it. I never get up that early here in NYC to see the sunrise. With all the buildings around me I don’t think I can see it anyway! in the summer, the sun rises too early for me to see it and when we get away to the lake – the trees block the sunrise, but we get an amazing sunset across the lake! thanks for stopping in! That is one of my favorite Beatles songs. Very nice. Watching the sunrise with that song would definitely be O.K. Thank you – I am still mulling King or Einstein! and thinking – hope you had a great week! Beautiful sunrise pics. I love to snap sunrise pics when I take my kids to school. That first shot on this post is out of this world! thanks! sometimes I get a great look! Yesterday was cold and clear with no clouds. The sun was bright all day long and it was cold as all get out. But it was still gtreat to see the sun coming up on the horizon bright, clear, and golden! It’s Super Bowl eve (or at least the day before) and the sunrise broought our first covering snowfall and I had to shovel the driveway. First time this season. Your change sounds exciting – where in the world are you moving? and what are you doing? Congratulations and I wish you luck! The problem with me is that I am a late-to-bed, late-to-rise kind of person. I was born with my internal clock set at “Night Owl” – just ask my mother! I can never get these kind of sunrise shots. These are beautiful! And I do love the sun, and George Harrison. 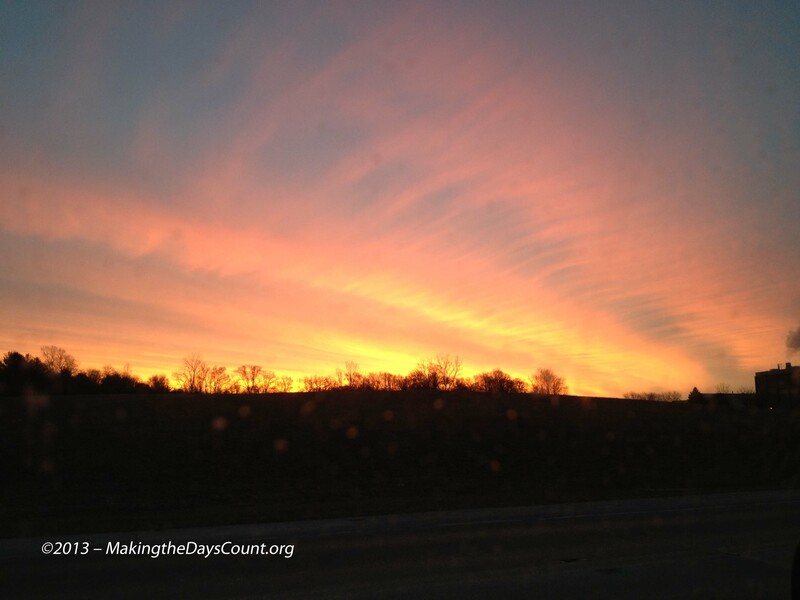 Thanks for sharing your sunrises! I’m sort of ‘forced’ to see the sunrise (and sometimes the sunset) it rises on my way to school at this time of the year… when the days gget longer and during the summer it rises far too early for me to see it regularly. The back of the house faces west and we some spectacular sunsets as well, though the best are during summer when we are at the lake. Thanks for stopping by!